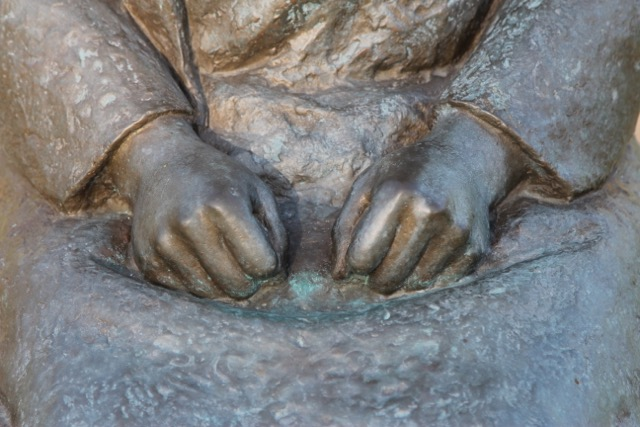 The Peace Monument calls attention to the experiences of young women, who were violated during World War II. 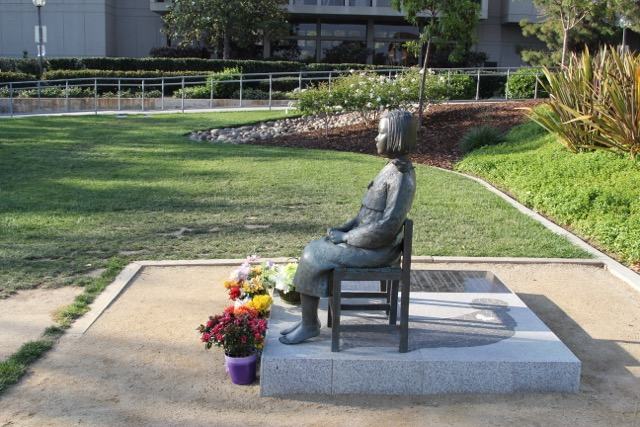 With 1100 pounds of bronze, the husband and wife artists Un-Sung Kim and Seo-Kyeong Kim offer their sculpture to honor those who have been euphemistically referred to as “comfort women.” Their artwork was commissioned by the Korean American Forum of California and is located in the city of Glendale. 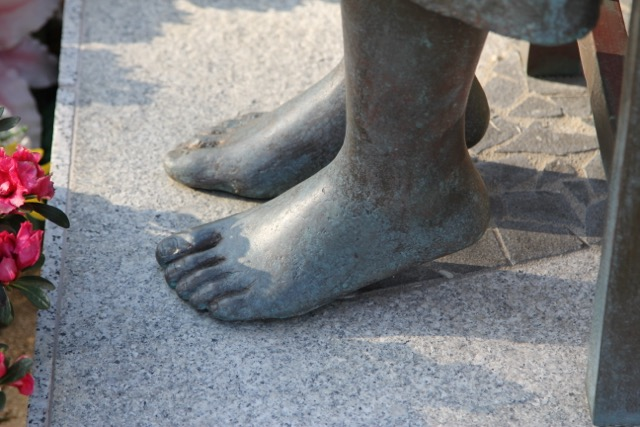 Although this sculpture is a replica of one in Seoul, South Korea, there are differences – most notably their context. The first Peace Monument in Korea is located on an urban sidewalk, across the street from a foreign embassy. The Peace Monument discussed in this meditation is in the middle of a quiet and verdant park. While this artwork rightly elicits a call for justice, we must not rush over the call to lament. With this in mind, I have chosen to withhold regard for the perpetrators in order to focus on those who have suffered. Walking along a path from the main street to the Peace Monument, there was little to draw my attention to the artwork. If anything, the flowers that have been recently placed at the foot of the sculpture offer a sharp contrast to the dark bronze tone. Approaching the artwork with willful ignorance, my initial response was one of curiosity. The sculpture invited a closer look. 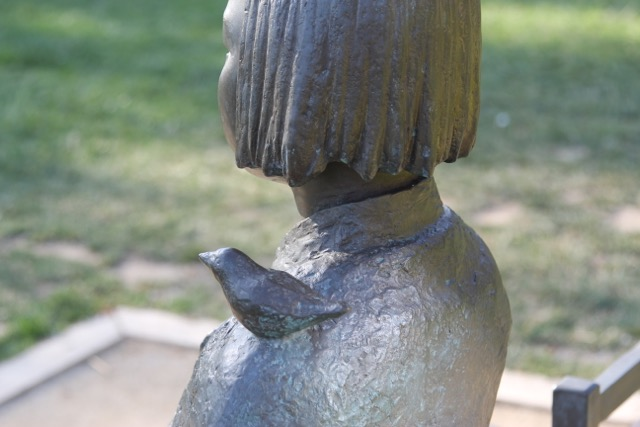 I was first drawn to the girl’s young face with its smooth texture in contrast to the rest of the sculpture. Then curiosity gave way to confusion. While thoughtful, the girl’s face was ambiguous in regards to emotions. It was not clear whether she was mad, sad or glad. Was it that the girl had no feelings? Or could it be that the plethora of emotions made it impossible for the sculpture to yield just one? Gazing away from the face, the girl’s extremities carried more of her raw emotions. Her hands are clenched and full of anger and determination. Her feet are restless. The heels are anxiously barred from touching the ground. Even the girl’s hair is withheld from peace. The jagged edges hint at her youthfulness carelessly severed. 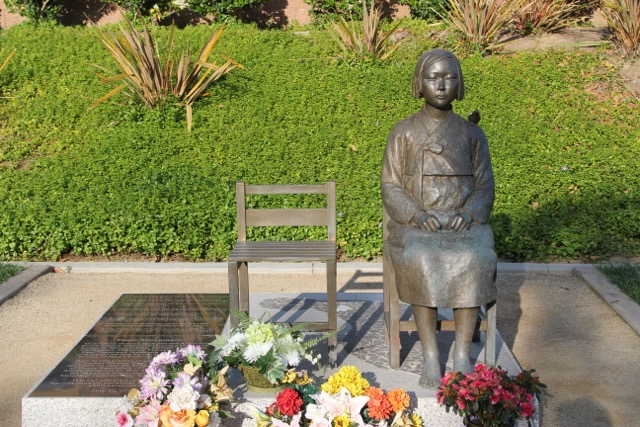 Kim & Kim’s Peace Monument is intended to honor the halmoni (Korean word for “grandmother”). Most of the “comfort women” – who survived their ordeals – are now in their 80’s and 90’s. Many have come forward to share their stories of abuse. At the same time, there are countless who have remained silent. While the sculpture represents those who have suffered, it cannot speak for all of them. We need to hear the individual stories. Before we can cry out for justice, we must cry with the victims and prayerfully enter the pain of those who elicited the shaded impression of an elderly woman. Moreover, we are called to “the valley of the shadow of death”, because Christ entered that place before us and with us. At the center of the installation is an empty chair. The chair reminds me of the need to be present with others. In the Bible, the afflicted Job was accompanied by his friends: “They sat with him on the ground seven days and seven nights, and no one spoke a word to him, for they saw that his suffering was very great” (Job 2:13). 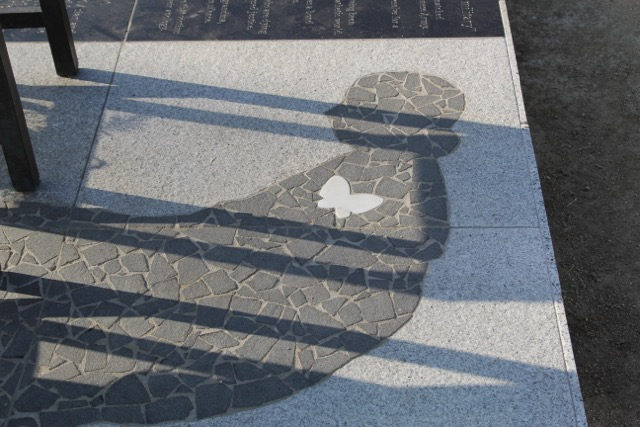 The Peace Monument likewise invites us to sit and lament with the women who have suffered. 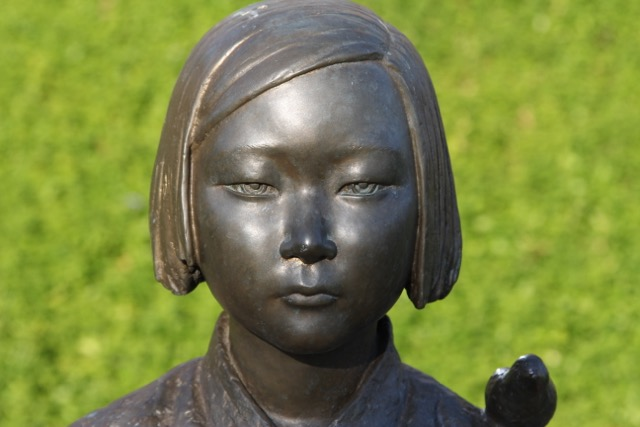 Un-Sung Kim and Seo-Kyeong Kim: Peace Monument, 2013, bronze, granite, obsidian, 4’6” height x 5’11” width x 5’3” depth. Glendale, California, USA. Un-Sung Kim and Seo-Kyeong Kim have been married since 1989 and currently live with their son and daughter. They both started studies in the School of Arts at Chung-Ang University (Seoul, Korea) in 1984. 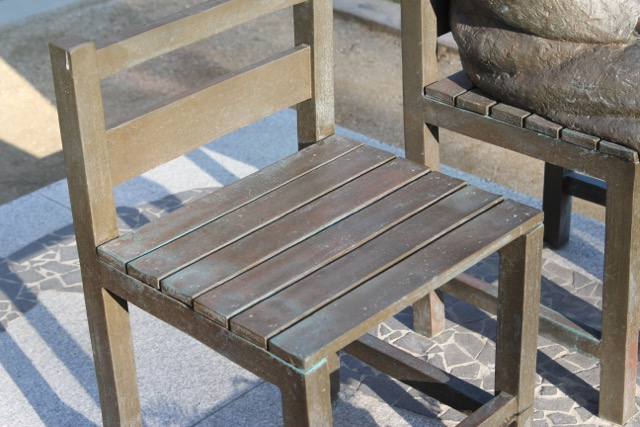 As individual sculptors, Seo-Kyeong has had five solo exhibits, while Un-Sung has had two. They have had 12 exhibits of their collaborative sculptures. Both artists care deeply for justice and have used their artworks to call attention to people, who have been neglected and abandoned by society. While their artworks may touch upon sensitive socio-political issues, Kim and Kim seek to make art that is meaningful with a lasting impression. S. Edward Yang is the associate director for the Institute for the Study of Asian American Christianity (ISAAC). He graduated from Regent College (Vancouver, Canada) with a ThM degree in Christianity and the arts. He is an adjunct professor and PhD Candidate at Fuller Theological Seminary (Pasadena, California). With plans to be ordained as a teaching elder in the Presbyterian Church (U.S.A.), Edward recently completed a unit of Clinical Pastoral Education at the Methodist Hospital of Southern California. He is grateful to the hospital staff and chaplaincy cohort for the insights gained to write this meditation. Edward and his wife, Sunnie, live in Pasadena with their three boys.